Well, I can't speak for the MPs, but I'm most certainly surprised to be made aware of this little nugget. And having been made aware of it; my, how things do drop into place. What am I talking about? 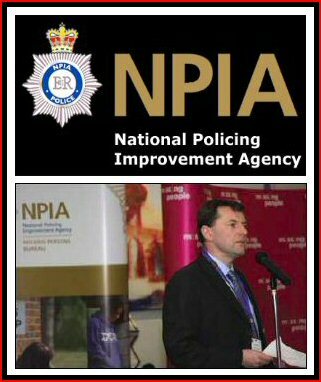 Probably the most singular bizarre incident in the whole of the Madeleine McCann affair, even more bizarre than Jim Gamble's unequivocal support of Kate and Gerry McCann, the appearance as guest of honour of Gerry McCann, at the NPIA's Annual Police Bravery awards; sponsors, as we now know, News International. Pray forgive me if this is common knowledge, as you will have no doubt gathered, this is a revelation to me. Before the article in question, two brief histories. The father of missing four-year-old Madeleine McCann has praised the "sterling work" of police officers and detectives in the UK. Speaking at the National Police Federation annual bravery awards last night, Gerry McCann said the role of police forces was "often not appreciated until you really need their help". Leaving his wife Kate and two young twins behind in Portugal, Mr McCann has flown to Britain to talk to police involved in the search for his daughter. She remains missing after being abducted from her bed while she slept at a holiday resort in Praia da Luz, the Algarve, on May 3rd. He will also visit the Child Exploitation and Online Protection Centre later today to discuss their role in aiding Portuguese police find Madeleine. At last night's award ceremony, attended by Prince Charles, Mr McCann received a standing ovation from police officers, which he described as a "humbling" experience. And this from the inimitable Blackwatch [Sargents Inn Blog]. “they will become a leading force in the world to get rid of the hidden evil in our society, and to out those who try to cover up for the tragedies these criminals can cause”. For a couple who were at this time suspects in their daughter's disappearance, the statement brokered something of a paradox; just how could these two ordinary individuals who had been openly pilloried for their routine negligence transform themselves into credible figureheads for law-enforcement overnight? Within the time it took to finish one glass of wine and discover one of your children missing, the McCanns exchanged their prison-issue denims for outfits tailored to a more 'practical' design. And what at first had sounded like a most absurd suggestion by one deluded forum member steadily acquired some semblance of authority. Retracing our steps to mid-July 2007 and we find ourselves standing alongside hundreds of dumbfounded uniformed officers at the Dorchester Hotel, invited from our seats by senior personnel to applaud one Gerald P McCann at the Police Bravery Awards. First we’d had the poignant video of his daughter, then the speech praising both UK Officers and the Polícia Judiciária, now we had the standing ovation. And for what? Just what were we honouring? Gerry’s contribution to ‘what’ exactly? One of the serving South Yorkshire officers receiving an award there that night described it as one of the most surreal events of his life. Sitting at his table was none other than Gerry McCann, 1500 metre junior running medallist and celebrated kidnap personality. And he wasn’t just down on the guest-list; Gerry was guest of honour. It was like having Mark Stanley - the man responsible for shutting the doors on the Herald of Free Enterprise as it left Zeebrugge - guest-of honour at the annual Maritime and Coastguard awards. Naturally, not even this prepared us for what was to come. But just how did we get to this stage? "I had this mental image of being in a tunnel and instead of the light at the end of the tunnel being extremely narrow and a distant spot, the light opened up and the tunnel got wider and wider and went in many different directions .... I can't say it was a vision because I am not clear what a vision is but I had a mental image and it certainly helped me decide. I became a man possessed that night. The next day I was up at dawn, making phone calls." 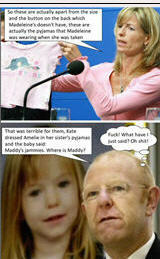 At this point in time Madeleine has been missing, presumed abducted, for little more than 3 weeks. But in what can only be described as an epiphany or profound breakthrough, Gerry McCann is sufficiently inspired and transformed enough to pursue a totally new direction. At a time when most people in his position are coming round from the effects of a mild sedative Gerry decides to resign his position at Glenfield Hospital and spearhead a campaign on behalf of missing and exploited children everywhere. His mission starts modestly enough; a meeting with SOS Crianca, the main child welfare non-governmental organisation in Portugal and then to London for a meeting at the Headquarters of the Child Exploitation and Online Protection Centre. And then things start getting a little giddy. Gerry visits the National Centre for Missing & Exploited Children in Washington, bonds with the US attorney general Gonzales at the justice department, grapples at the White House with the First Lady's deputy chief of staff, Sarah Armstrong and follows it up with a mid-afternoon jog up Capitol Hill for meetings with Democrat congressman Nick Lampson and Republican Senator Robert Shelby. And then, of course, we have that ill-timed appointment in Edinburgh with Kirsty Wark who interviews Gerry at the Edinburgh International TV festival, shortly before he and his wife are declared formal suspects. Not bad for a couple from Leicester who were presumed reckless enough to leave their daughter unattended for several nights of the week on a jolly old Summer Holiday with their mates in Portugal. There is a great deal more to this article which can be found here. The article in question, from 2009 no less. And only discovered in researching an article to come, on Yates of the Yard misuse of public funds in hiring Carter-Ruck in an attempt to gag solicitor Mark Lewis. But more of that later. A curious, alarming anomaly was revealed last Wednesday during a session of the Commons Culture, Media, Sport Committee. 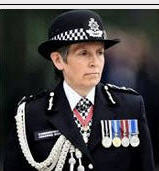 A very senior police officer told the committee that while investigating the News of the World phone-tapping incident, an unequivocal piece of evidence had not convinced his officers that it required further investigation. This evidence was the now infamous email sent from junior screws hack, Ross Hall (AKA Hindley) to contract private investigator, Glenn Mulcaire, which said: ‘This is the transcript for Neville,’ with the transcript of a message left on the voicemail of Gordon Taylor, boss of the PFA, intercepted and recorded by Mulcaire. Mulcaire pleaded guilty to hacking into Taylor’s voicemail after he’d also admitted to hacking into the voicemails of members of the Clarence House staff. He was jailed for these offences (which the News of the World encouraged him to commit by giving him a special contract signed by former Screws news editor, Greg Miskiw), and he served his sentence. 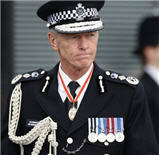 The Metropolitan Police investigation, headed by Detective Chief Superintendent Philip Williams, decided that despite the email’s clear reference to senior Screws hack, Neville Thurlbeck, clearly connecting him to an illegally acquired phone message, there was no basis for questioning Thurlbeck. There was, they said, no evidence to put to him or any other News of the World staff whose names had cropped in connection with this entirely unroyal-related hacking. If this seems strangely lacking in diligence on their part, it seems even more so after hearing evidence given to the committee, after the police had appeared, by Mark Lewis, the lawyer who successfully sued the News of the World on behalf of Gordon Taylor. We learned from him that after he had acquired a court order requesting documentary evidence of Taylor’s complaint from the Metropolitan Police, Detective Sergeant Mark Maberly told Lewis that he “wasn’t having everything, but we’ll give you enough to hang the News of the World over Gordon Taylor”. This statement, as reported by Lewis is unequivocal, and it’s out of the question that he would dissemble in front of a Parliamentary Committee. 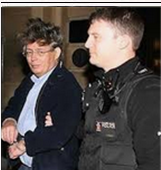 Besides, the Screws offered a £1m to shut Taylor up before the case got to court, so the evidence clearly was damning (for they had denied any knowledge of the offence until Lewis produced the Met’s evidence). 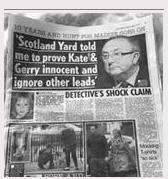 Why on earth didn’t the Met choose to prosecute the paper themselves when they had such a clear case? Lewis’s evidence makes a nonsense of what Asst Com Yates had told the committee only half and hour before. He should be called in again to explain himself. 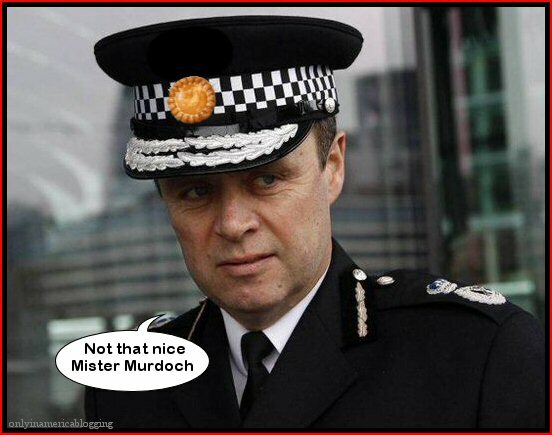 The police had been asked by one of the MPs about their relationship with the News of the World. Not surprisingly Yates offered some weasel stuff about needing to a have a relationship with such an “important newspaper”.